In 2013, I walked through roughly 24 grand challenges to space settlement and set about breaking it down as a scientific, engineering, and business problem simultaneously. The key was to find a way to flatten the investment and innovation curves required (reducing time and saving money) while making things modular and keeping consistent standards for the first major phase of space settlement. This series will break down each challenge, the current state of the solution set, and proposed paths to move forward efficiently. Radiation is one of the more difficult challenges of sending crews into space for extended periods. Primarily, there are two sources – the sun and interstellar space. While crews in Low Earth Orbit (LEO) are largely protected from solar flares by the Earth’s magnetic field, we have little experience in the environment beyond LEO other than the Apollo Moon missions. This combination of the unknown and the intensity of the problem is one of the greatest psychological barriers to gaining the political will to explore deep space. Space radiation comes in two principle forms and several variations. We will discuss each in turn. When a solar flare occurs, some of the trapped radiation crashes back into the sun's surface. This can release strong bursts of x-rays and gamma rays. Since these are light radiation, they can reach Earth's orbit in eight minutes. Since we can see the flare erupt before the trapped particles crash back into the sun's surface, we may have up to five minute's warning of a radiation burst of this type. Shielding from x-rays and gamma rays can be achieved by the same methods as protection from Solar Particle Events. That said, the radiation would arrive with far less if any warning. The hull of the spacecraft would be adequate protection in all but the most extreme cases. Also, light decreases in intensity with the square of distance. Therefore a flare would have 40 percent as much energy by the time it reached the orbit of Mars versus the orbit of Earth. The sun emits a strong solar wind that produces a relatively steady flow of protons and helium nuclei (alpha particles) and electrons. Since these are positively or negatively charged, the magnetic field of the Earth deflects or traps these particles into the Van Allen radiation belts. For crews orbiting below the belts, say on the International Space Station, they are protected from this radiation. The radiation belts are intense for humans, but they are also at the same altitude as our geosynchronous communications satellites. Therefore, we have decades of experience in engineering computers, solar panels, and other systems that can operate in the radiation belts for extended periods. Any neutrons emitted by the sun never reach beyond the orbit of Venus. When a neutron is isolated from an atomic nucleus, it decays into an electron and a proton within an hour, with a half-life of 10.5 minutes. Neutrons may be emitted from the surfaces of worlds without atmospheres, because cosmic rays can knock those neutrons off the surface atoms. This is how several lunar and asteroid probes examine the chemical composition of the surface of the worlds they orbit – by examining these neutrons as they hit detectors on the spacecraft. These are more commonly known as Coronal Mass Ejections, solar storms, or solar flares. All three terms are related. A solar flare occurs when the magnetic fields on the surface of the sun twist like a rubber band until they break. The flare can release bursts of ultraviolet and X-ray radiation, which reach Earth in eight minutes and can disrupt the Earth’s ionosphere. Any particles trapped in that field are thrown out at such incredible speed that they cross the 93 million miles to Earth in a day and a half. The particle bursts themselves are called Coronal Mass Ejections. When they hit a planet or vehicle, they are called SPEs or solar storms. These bursts are deflected by the Earth’s magnetic field to the poles, where they collide with the atmosphere and produce aurora. Similar aurorae are also visible on other planets in the solar system with magnetic fields and atmospheres, such as Jupiter. While these magnetic fields protect planets, there are events so intense that they can overwhelm these magnetic and atmospheric protections and cause power blackouts and other electronic disruptions. In deep space – starting in high Earth orbit and going to interplanetary space, there is no magnetic field to block these events. Fortunately, the types of radiation and intensity are relatively easy to block with 6-12 centimeters of shielding in the form of water, food, or plastic. Small deep space vehicles (such as the Apollo command module) can simply turn the heat shield and service module toward the sun to block the radiation from the crew. The lunar module had no protection from flares, so crews would have been vulnerable on the surface of the Moon. GCRs are high energy particles that largely come from beyond the solar system. Despite the name “rays”, they are not photons, but particles like the solar wind. They are accelerated to near the speed of light by events such as exploding stars. Roughly 85 percent are protons, and one percent are electrons. Nine percent are alpha particles (two protons – a helium nucleus). Roughly one percent are heavier atomic nuclei, called HZE ions. This is where the problem comes in. These particles can be the nuclei of heavier atoms- from lithium through iron. An iron nucleus hitting a spacecraft has the force of a baseball thrown at 55 miles per hour. It can hit the nuclei of other atoms and split them, and those nuclei can hit other atoms and split them, and so on until the cascade loses momentum. Iron nuclei make up one percent of HZEs, or one-one thousandth of cosmic radiation. Of those, most are lower energy levels. Cosmic rays have a charge. Electrons are negative, whereas protons and nuclei are positive. The Earth’s magnetic field can deflect the lowest-energy 10 percent of cosmic rays near the equator. It does almost nothing to deflect them when the space station is in orbit nearer to the poles. The earth’s atmosphere blocks cosmic rays from hitting the surface directly, though most form cascade events like the one described above. These particles are called secondary cosmic rays, and many reach the Earth’s surface. There are enough of these particles penetrating your body right now that you are being exposed to the equivalent to a chest X-Ray every year. If you live in the mountains or are an airline pilot, your dosage is higher. Fortunately, the worst radiation is also the rarest. The most dangerous radiation known will only pass through an area of space a kilometer across every year or two. The most frequent radiation can be blocked most easily. Ironically, the sun’s magnetic field expands during times of violent space weather and calms during solar minimums. This expansion reduces the exposure to cosmic radiation, because the sun’s magnetic field deflects it, much like Earth’s magnetic field, but over a much greater distance. However, the sun also is more prone to solar flares during these periods. 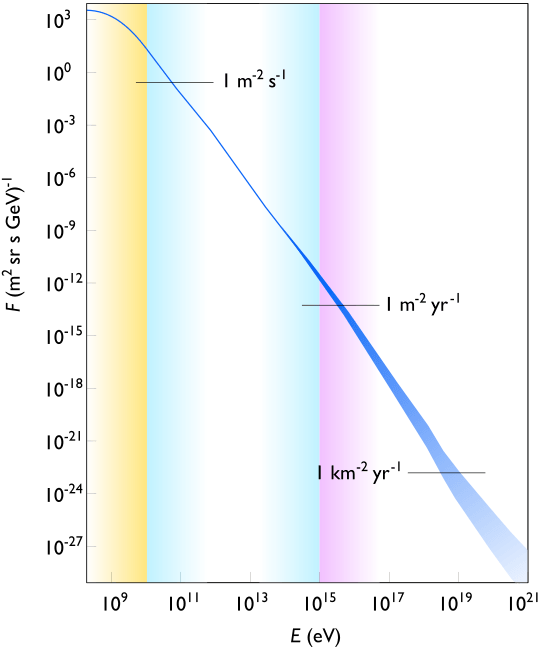 Cosmic Ray density (flux) is shown on the vertical axis, and the intensity of each particle is shown horizontally. Particles in the yellow zone are basically solar radiation, but beyond that, they are cosmic rays from supernovae and other galactic events. The most frequent particles 10 per centimeter per second) are the least harmful individually (lowest energy). The most harmful (iron nuclei are 40,000 times more harmful, and carry much more energy due to mass) are also 40,000 times rarer in the universe. The absolute worst only hit a square kilometer every year or less. Cosmic ray protection systems, therefore, must cover enough of the high flux, low energy particles to remove them as completely as possible. It should also reduce the hazard (energy level) of any high-energy particles as much as possible, to reduce the damage inflicted when they do hit. As recently as ten years ago, we had little understanding of the cosmic ray environment. Our margins of error were as much as 600 percent. That has largely been remedied since then due to the AMS on the space station, and radiation instruments on lunar and Mars missions. We have yet to launch crews into near-lunar space to do animal research on the full deep space environment. We need to do animal research to assess the impact across generations. It also needs to be done with a spinning vehicle to simulate gravity. Some impacts on health are microgravity, others radiation, and others both. For example, the tendency to not grow more bone may be some combination of microgravity making the bones less stressed and radiation killing off the cells that make bone. A future Space Settlement Lab could solve for gravity and radiation at various levels of each. This is not currently planned by NASA or New Space companies, but is something I would recommend. Phobos: The inner moon of Mars, Phobos, orbits very close to the surface. A base on the side that permanently faces Mars would have Mars fill most of the sky. Since the asteroid moon itself would block the other half, cosmic radiation would only come in from near the horizon. A large crater is on the side facing Mars, and the walls of the crater would block most of that. In other words, a base in this crater would be completely exposed to space, with no magnetic field or other protection, and yet have an extremely low radiation environment. Polar Craters on the Moon and Mercury The poles of the Moon and Mercury have almost no axial tilt, and permanently shadowed craters. While exposed to cosmic rays, any solar activity would be moot in these locations. Jupiter's Radiation Belts The radiation belts of Jupiter are the most deadly in the solar system. The intense magnetic field has captured enough radiation to make crewed missions to Io, Europa, and Ganymede highly unlikely in the next generation or two. Callisto orbits outside these belts. The radiation environments of Saturn, Uranus, and Neptune are far less dangerous. Despite some beautiful science fiction, do not anticipate crewed missions to Io or Europa anytime soon. The radiation environment is so intense that engineers are deeply challenged to think of ways to make robotic missions to Europa with a lifespan of more than a few months. The solution set varies depending on the length of exposure. A simple mission to the moon like Apollo will not be exposed to cosmic rays long enough to worry much about exposure levels. A multi-generational settlement in deep space would need levels of protection comparable to mountain cities on Earth. Almost every form of it is positively charged, and therefore is influenced by magnetic and electric fields. Since all particles are negatively charged or relatively weak, they can be deflected with magnetic or electrostatic fields. The problem is that the magnetic field must have a greater charge than the cosmic ray or solar particle in order to deflect it. Proposals for electrostatic balls above a surface installation seem fanciful. Some serious proposals for magnetic shielding have been proposed, which involve magnets folded on themselves to prevent the fields from entering the cabin or the space around the vehicle. The most abundant forms are also the easiest to stop, both in terms of energy and composition. A little shielding goes a long way. The hardest forms of radiation to stop are also the rarest. We know we need 6-12 centimeters to stop solar storms. We may need more than that to stop cosmic rays. The need for added protection goes up with crew size and mission duration (exposure time). Cosmic rays can be absorbed by materials, much as the earth’s atmosphere absorbs them. The trick is to avoid using shielding with an atomic structure with too many neutrons. The higher the atomic weight of the structure, the more secondary radiation the crew will deal with. Lead would be a horrible solution. Hydrogen is an ideal solution, but difficult to store in any density or stability. Most solutions involve layers of water (as mentioned with solar flare shielding) or plastic with a high hydrogen content. A surface or asteroid settlement can be buried under meters of surface material for shielding. While specific levels of shielding are a subject of ongoing debate, the working levels from past designs were four meters of water or five meters of surface material. The thin atmosphere of Mars provides some protection from solar flares and the lowest levels of cosmic radiation. The planet’s surface provides the remaining protection. Bases buried or covered with local sand or bags of ice would be well protected. The lighter the shield material, in terms of atomic weight, the better it is for avoiding secondary radiation from cascade collisions. A faster vehicle has less exposure to radiation, because the crew is not in space as long. The ITS has the potential for faster transit times to Mars. Faster concepts for engines in deep space generally also have very slow acceleration. They are useful for getting beyond Mars or Venus, but are of marginal use for Mars. This is mainly an issue of maintaining health to minimize the opportunities for cancer or other health issues to advance. We have learned more about the sources of cancer and how to mitigate the impact of radiation. Missions propose using a finely tuned combination of diet, drugs, and exercise tuned to the individuals on the mission and their genetic profile. Even positive psychology can be considered the last line of defense, since patients in better spirits are more likely to recover than patients in depression. A spacecraft’s defenses may start with a deep magnetic shield off the surface of the vehicle and end with a deep collection of comedy movies for the crew. Every layer would mitigate some tiny fraction of danger, and collectively reduce the risk to the minimum possible level. Any solution will be a trade-off. An added layer of three centimeters of protection may be absolutely necessary or completely wasted. That layer would add tons to the mass of the spacecraft. That mass could be dedicated to better systems, spare parts, or other safety features. The question is which crew is safer – one with better systems or with better insulation?